January 2012 - farm news! Posted 1/2/2012 2:33pm by Gregg Keckler. Happy 2012! We are pruning, cleaning up the raspberries, mowing, preparing the ground, and staking for new raspberries and new trees. Oliver and James are pulling up tomato stakes and cages. Gregg is making jam and building crates and also tending the greenhouse lettuce and arugala. We did a few major projects in December includng replacing the water supply line at the barn. James had to dig a hole about 5 feet deep by 4 feet across to replace the pipe. Then he and Virginia dug a 12 inch trench in front of the garage across the entire front and put in drainage pipe. This will hopegfully keep water from running in under the garage doors during heavy rains. Our new 2012 CSA sign up is ready to go! We have changed the price of the full shares to reflect the larger amount of fruits and vegetables. We have not changed the half shares. You can order online. Go to our website www.orchardcountryproduce.com. Go to sign up page and walk through the form. We are offering two choices for payment. You can pay with paypal(a small processing fee is charged for this option) or you can pay by "invoice". If you choose invoice after your sign up you can send us a check in the mail. No need to download any forms! In order to get the $30 discount you must pay by April 30. We are offering a payment paln if you are getting the entire season (full or half shares). Just pay the down payment amount now at the checkout. (If you choose invoice you can just send a check for the amount.) and then pay that amount each month after; February, March, and April. We will send you reminders monthly. Cedar Lane Unitarian Universalist Church, Bethesda - Saturday. Oliver would like to start a farm stand location on Saturdays in Arlington or Alexandria area. If anyone knows of a church parking lot or a business location in any of these areas, please let us know. If you have any questions about the sign up process or any of our growing practices, etc, please contact us and we will be glad to answer any questions. Our daughter, Sarah, was home for a week's vacation from her job in Alexandria and she cleaned up our website and added some new information. Check it Out! James, our intern for the year has been keeping after the facebook page. Check it out for tidbits. If you signed up for our Winter De;livery, we will be sending you an email soon about the January delivery announcing the store opening for January. Enjoy the great cold wintery weather. stay safe and do what you can to relieve stress and eat healthy! Posted 12/9/2011 11:45am by Gregg Keckler. Monday December 12 at 11:00 pm is the last time to order for the December 15 Winter Delivery. If you are planning to order, do not forget to go to our website - www.orchardcountryproduce.com and go to the store to order items. You can pay with paypal or if you would like just contact us and we can send you a bill through email and you can send us a check for the amount. Posted 12/6/2011 9:48am by Gregg Keckler. We are keeping very busy with repairs and maintenance of the soil and the buildings. 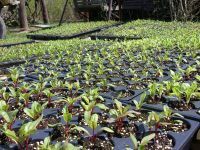 We have the greenhouse cleaned up and we have some very nice arugala and lettuce mix growing for the winter delivery. The mild temperatures have been very helpful here. We have not been able to get into the fields to plow or clean up the black plastic because of the rain. We may be dong this in January! That would be a first - to be plowing in January! We are sorting apples and taking some to auction each week. We are saving the best ones for the winter delivery and for spring market sales. NEW WEB ADDRESS- www.orchardcountryproduce . You can still use the old one for awhile, but we plan to eliminate it so change your bookmark if you have us saved. For the winter delivery - you can go to the website www.orchardcountryproduce.com and order from the store and pay with paypal. If you do not have paypal and do not want to get it, you can still order. Just send us an email and we can let you know how to do it. The first delivery is scheduled for December 15. thanks to everyone who has order so far. If you would like to get in you must order before December 12. We have had three steers butchered in the last two months and we butchered 23 turkeys! So we are stocked with meat and bologna. Gregg is buying seeds, trees, new berry plants, and other plants for spring planting. We will let you know when we will have our tree planting day this year. It will be sometime in April. We are also planning to do some new companion planting to help with pest control especially groundhogs and deer. The deer destroyed many trees last year. and the groundhogs were a constantly problem in the cabbage. I am working on the new subscription form for next year. There will be a few changes. The changes will effect only full shares. We are raising the price of the full shares for 2012. For the past 5 years we have given a tremendous discount to full shares because we knew that we did not have enough produce or fruit to give the full shares exactly double the half shares. But this past year we actually had enough of everything to double the half shares completely for the full shares, so we felt it was time to raise the full share prices to reflect this. The full shares will cost $880 for the full 21 weeks paid before April 30th. The price for a full share individually for each 7 week session will be $300. The half share prices will remain the same. $450 for 21 weeks paid before April 30th and $160 for each session individually. I should have the subscription form up by the end of this week. Thanks to everyone who bought from us in 2011 and we are looking forward to a better CSA in 2012. PS - If anyone knows of a good location for a farm stand in Arlington or Alexandria area, please let us know. We would like to start a small farm stand in these areas so that we can have another CSA drop off spot for Saturdays. Posted 11/11/2011 1:51pm by Gregg Keckler. Send an email if you would like to order anything for delivery on Saturday. If you need bulk amounts of apples, pears, pumpkins let us know. We will try to provide it for you. We want you to consider us your local farm! THE GREENS are coming back! We have SWISS CHARD! Lettuce Mix! Brussel Sprouts! - great fall vegetables! Fairy Tales! One of the best winter squash for soup! We have TURKEYS for THANKSGIVING! Come down and order your turkey for delivery! Jams - We have your favorites - Raspberry, Strawberry and some different ones - fruit and veggie jam, Mint Jelly and others. Posted 11/7/2011 9:37am by Gregg Keckler. We are getting ready for our Winter Vegetable and Fruit delivery. If you haven't contacted us yet about joining send us an email now - so we can put you on the list. We will have the E-Store up and running by December 1 for the first orders. We will be doing the first delivery on Thursday December 15. All orders will need to be in by Saturday, December 10. Let us know ASAP so we can reserve a turkey for you. The price is $3.99/lb and the turkeys are mostly between 10 - 15 lbs. There may be a few smaller and a few larger. These turkeys ate grass, bugs, nectarines, and cracked corn and enjoyed life in a mobile home with portable electric fencing. We had some pretty serious damage from the 15 inch snow that we had on October 29. Several very large trees either came down or dropped large branches which distroyed fences everywhere. We are still trying to saw up the big trees and repair the fences. In the meantime our cow in locked in the barn and she is not very happy about it. We have started some lettuce in the greenhouse. We are hoping that it will mature for winter deliveries. We still have lots of broccoli, cabbage, cauliflower, and Brussel sprouts and winter squash. The tomatoes are finished, but we are still selling peppers and alot of onions. We just picked the Gold Rush apples and we still have the Pink Lady apples to pick yet. We will be making some gift boxes including apples, pears, winter squash, jam, etc for purchase for the December 15 Winter Delivery. So keep these in mind if you are planning gifts for the holidays. Now we are in the middle of serious cleanup - washing and disinfecting all coolers, storing boxes, sorting apples, clearing tomato stakes, plowing and planting winter barley and rye for green manure. Gregg is ordering some new trees and raspberries for next spring planting. We hope to have our new subscription form on the website by December 1. We will begin taking subscribers for 2012 after January 1, 2012. Have a great Thanksgiving! Remember the bountiful harvests that we had this year and give thanks! Posted 10/27/2011 4:14pm by Gregg Keckler. Send an email if you would like to order anything for delivery on Saturday. If you need bulk amounts of apples, pears, pumpkins, or anything let us know. We will try to provide it for you. We want you to consider us your local farm! THE GREENS are coming back! We have ARUGALA! KALE, SWISS CHARD! Lettuce Mix! Spinach! Broccoli, Kohlrabi, cauliflower Brussel Sprouts! Posted 10/18/2011 5:38pm by Gregg Keckler. Posted 10/17/2011 1:08pm by Gregg Keckler. Rinse and dry two small pears or one large pear. Grease or spray a 9" square cake pan. Preheat oven to 350.
until smooth. Pour into prepared pan. and the milk at low speed. Then beat at medium-high speed for one minute. three rows of five slices evenly on sugar mixture in pan. Eat the sixteenth slice. several minutes before inverting on serving plate. Enjoy! Posted 10/17/2011 9:18am by Gregg Keckler. This week's list includes: apple cider, Suncrisp apples, honey, acorn squash, cauliflower, and 2 mystery items. We are still not able to get into the place where the potatoes are buried. We still need some drier weather in order to get a plow into the ground. So the mystery items will be probably items above ground. The honey is our own raw honey - straight from the hive! I do not refrigerate it, but just sit it on the counter. If it should crystalize, you can heat it or just use it crystalized. Many people prefer crystalized honey because it is easier to spead. When you finish with the jar, PLEASE RETURN IT! Try to find different recipes to use winter squash. This is their heyday - enjoy them! I made a side dish with acorn squash, onion, celery, and dried cranberries. It was a savory dish and was delicious with sausage gravy. There are many sweet or savory recipes for winter squash. Suncrisp apples are a nice, tart, crisp, yellow apple. We will be butchering turkeys this week. We do not have many, but we will give the CSA first chance to buy them. Let us know if you would be interested in buying a turkey. I am sorry but we do not have a price yet, but they should be mostly 10-15 lb/each. They will be frozen. We have had them out on grass and have supplemented with a turkey grower (no animal proteins). We have had a lot of response for the winter deliveries. We are coordinating delivery areas and possible days. We need to find a good convenient location near DOT that everyone near there can go to. If you want a delivlery at/near DOT and you have adequate space for a delivery and a place where folks can pick up their items, please let us know. So far these places will deifintely have deliveries -DOT area, DC NE(between 10th and 12th St., NGS, Gangplank Marina, Bethesda(near Cedar Lane Church), JBS(North Bethesda), Rockville, Gaithersburg, Columbia/Ellicot City. We have had some response from these places, but need a few more for a delivery: River Park, Mt Vernon, Reisterstown, Westminster. Email if you would like to be part of a winter delivery to any of these areas. Let us know if your location would like a delivery. about 3 - 4 lb whole chickens $5.99 /lb ONLY FOUR LEFT! Posted 10/13/2011 7:54am by Gregg Keckler. Yellow Bartlet pears! Bosc Pears! THE GREENS are coming back! We have ARUGALA! KALE, SWISS CHARD! Lettuce Mix! Broccoli, Kohlrabi, cauliflower - great fall vegetables!